Pop-Quiz Homework for HRDQ Webinar Participants, March 20th 2019 | Training from the BACK of the Room! On the HRDQ website, you’ll find dozens of free webinars, as well as for-purchase training games, assessments, workshops, and simulations for instructor-led classroom learning, and e-learning and e-assessments for distance learning. “Pop Quiz Homework” is one of my webinar’s “Follow-Up” activities. Brain scientists call them “spaced practice” – activities that help move learning into long-term memory. Answer the question above in a paragraph or two and send your answer to me via email at sbowperson@gmail.com or type your answer into the “comments” section below (it will appear in my website’s “inbox” so that I can respond). On one side of the handout are “Warm-Ups” and “Follow-Ups” – resources to explore before and after the webinar. On the other side are note-taking boxes that participants used during the webinar. Also, be sure to click HERE for the free, downloadable infographic that accompanies the webinar. The concepts covered in the webinar were taken from my book titled Using Brain Science to Make Training Stick, available on Amazon. The book covers six learning principles that trump traditional training and contains the instructions for 30 activities (plus e-learning variations) that are tied to the six learning principles. For live, public workshops that cover the concepts/activities in both my brain science book and Training from the BACK of the Room, click on my website’s What’s New? or Training Events pages. I too enjoyed your webinar! I appreciate the simple, yet effective tactics you shared for keeping our brains engaged. I believe you demonstrated many of the elements you have asked us to describe through your presentation style and hands-on activities. For me, you demonstrated the element of novelty via the use of a graphic organizer with the post-it notes and one-page blank grid we filled in. Contrast was demonstrated by the ‘change anything’ technique which you used throughout the presentation, such as by switching from the post-its to the wall-walk, to the slides, etc. The presentation was never boring. I liked the use of writing over reading as a way to help reinforce meaning in which the participant refines their thinking by handwriting notes as they receive and interpret content. Finally, I’m a big believer in the use of storytelling and powerful images to convey both meaning and emotion. I learned a lot from you in a brief period. I look forward to checking out your ebook! Thanks again. I absolutely enjoyed your presentation of the content and creating the experience of using the content all in one quick webinar. Love the Pop Quiz Homework! 1) You were novel in your approach to us the audience with your ice breaker, use of picture slides, and the building in of the activities of deep breathing and stretching from the outset. 2) Your use of contrasting slides and presentation style different from traditional “Death by Power Point” and “Sage on Stage” was refreshing and engaging. 3) Your focus on meaning and what we as educators are aiming to do to teach, inspire and influence our students/audience participants, by engaging their brains to learn was awesome. 4) Your attention to emotion was powerful and I love the analogy of emotions being “sticky notes” in our brains of what is important. My biggest emotional moment was with your picture of the alligator taking a bite into dental care. I am recovering from childhood trauma of an old dentist that breathed heavy and reeked of coffee and cigarettes as he was in my personal space and worked in my mouth as a child. So, as soon as I could make my own choices I choose to go to “no pain” kind female dentists for my dental care. As you mentioned, I will always remember your alligator picture, every time I go to the dentist. I will use all your pearls of wisdom as I do my work to promote self care and battle Burnout and Moral Distress in Healthcare. Thanks and keep up your strong work for making learning fun and engaging! Meaning-Learners need to be taken from what they already know to something they don’t yet know, something new.. The activity”Fast Pass where participants Pair up and communicate to each other something they know already or expect from the presentation topic was one example. 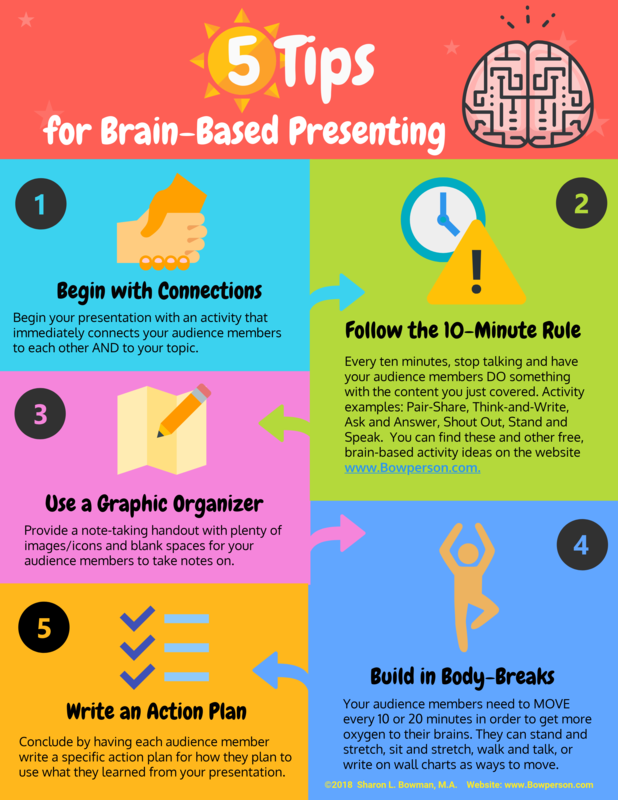 The elements of Novelty, Contrast, Meaning, and Emotion were used in a variety of ways during the “Brain-Based Presenting” webinar to get your brain to pay attention. Examples include: 1) Stand-Up Meeting: Plan to use the Stand-Up Meeting tool at my next staff meeting (15-20 minutes); 2) Use Images: Plan to use image rich PowerPoint slides with big font in place of boring/brain-antagonistic PowerPoint slides; 3) Thumbs Up, Thumbs Down: Plan to review material covered by adding statements on a PowerPoint slide for participants to read and then give a Thumbs Up if they agree or Thumbs Down if they disagree; 4) Change Anything! : Plan to add a variety of audience activities, tell stories, and use metaphors to keep audience engaged; and 5) Sit, Stretch, and Think: Plan to remind participants to stretch while seated and think about one change they might make as a result of what learned at presentation. Looking forward to getting a receiving a complimentary copy of the ebook Presenting With Pizzaz. I apologize that I missed the first part of your webinar today due to a work issue, so I am not able to talk intelligently on ‘novelty’ or ‘contrast’ as you explained them. I did hear the portion on ‘meaning’ and ’emotion,’ and liked your idea of using full screen-sized pictures with meaning to your topic in order to evoke emotion from the audience, which will help them remember. I have actually used this in my presentations and it really works well. I hope that will be enough information to qualify me for your e-book “Presenting with Pizzazz,” because I believe I could really benefit from having my own copy. Thank you for your consideration and your great webinar. great webinar, the presenter, Sharon not only discussed and defined NOVELTY, CONTRAST, MEANING, and EMOTION, but incorporated these elements in the presentation. I appreciated the use of short succinct and colorful attention grabbing images. I agree and use myself storytelling as a powerful way to gain attention and evoke emotion. Thank you, and I look forward to reading your ebook on presenting with Pizzazz. I loved the idea of using full slide photos instead of clipart and/or text. I often find that a photo is the only way to show emotion – clipart certainly wouldn’t work! I have been swapping clipart for photos in my own training presentations and I find the learners pay attention much more. I co-instruct a class on how to create and give presentations so I will definitely pass on your tips on how to keep the audience engaged and paying attention. I learned so much from you in the short hour – thank you so much! Thank you for a lively presentation. ‘Novelty’ was the practical application of how to add up the numbering sequence. There is not a right or wrong process. ‘Contrast’ was the comparison of how presentations have been done and how they can be better. BTW I appreciate the 4 general things that you provided for I was already making some of these adjustments, but now I have a relationship as to why. ‘Meaning’ was the impact of making a change by engaging participants in an enjoyable and informal activity. ‘Emotion’ was the impact of the alligator picture. Forever on my mind – as an example. What was the resource for photos hat was provided by a participant? We have clipart.com, unflash.com and pix###? Thanks again. The workshop utilized novelty via images that are less than typical such as large mouths with big teeth in a presentation on training. It utilized both novelty and contrast by asking us to stand during a webinar, getting more oxygen to our brains. Meaning was achieved through periods of reflections where we were asked to apply the concepts in our work and the story regarding the dental presentations. Images and stories provided opportunities to connect emotionally with the content. The sit-stretch-think was especially interesting to me as I work in a sector that has to create time for reflection because the work is emotionally challenging, unending and critical. That reflection time could be a real gift. The thumbs up/down review included visual elements, opportunities for social connection, and content review — all which help our brains! Your photographs illustrated contrast with colors, images etc. Your images also appealed to emotion (e.g….those that were to illustrate getting people’s attention by scaring them). You had us share how we used attention grabbers in the past which helps us put it into context/meaning. Novelty, Contrast, Meaning, and Emotion was used in several ways including full-slide, emotion-invoking images, stand/stretch, thumbs up/thumbs down, excerpts from a book which could count as short stories, new, novel concepts were introduced hit all areas of novelty, contrast, meaning, and emotion. Thank you again! Hi Sharon, thank you for the fun, engaging and informative online workshop yesterday! As a past teacher, I also remember the 10 min-24 hr-7 day rule (which may or may not be perfectly accurate anymore but does emphasize the need for repetition in transferring short term memory to long-term memory), so I especially like your “homework” check-in today. You did a great job of using novelty and contrast in your webinar by injecting funny, shocking or intriguing images periodically throughout your presentation. I also loved that you effectively invited us to be ACTIVE participants by writing notes, moving about in our spaces and responding to questions as a group–this contrasts with most webinars in which the presenter gives and participants take. You efficiently helped us break down the meaning of each of the six brain-based principles by providing us with a graphic organizer and asking us to relate with each principle by reading, saying, writing and drawing. I found myself actually relating that principle to my personal and work life as I drew icons representing each one. And perhaps most importantly, you used HUMOR in your presentation which is such an important emotion that immediately sets a low-stress tone/environment so that participants can relax and focus on learning. Thank you again, and I look forward to receiving your complimentary ebook.